The members of the student council of Hekiyou Academy are chosen by a popularity vote. As a result, all the members are cute girls except for Sugizaki Ken, who studied hard to enter the council. This novel is about the endless chatters of the members, full of parodies from various other works such as "The Melancholy of Haruhi Suzumiya", "Dragon Ball" etc. 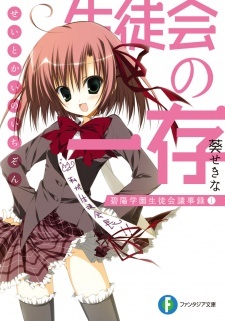 The series was originally planned to be titled as "Hekiyou Academy Student Council's Minutes (碧陽学園生徒会議事録, Hekiyou Gakuen Seitokai Gijiroku), but because of the length, the title of the first volume "Seitokai no Ichizon" was chosen to refer to the whole series. It is also called "Seitokai Series" by some.